A visit to the Canadian Rockies is a dream for many people, here and abroad. But what is it that the Rockies have to offer that makes them so alluring? Is it only the striking scenery, or other attractions? 1- The Canadian Rockies are not particularly high as big mountains but they are spectacular. Mount Robson tops them all at 12,972 feet. Its massive rocky structure, bare, and glacier laden, stands more than 7,000 feet above the pass and thousands of people view the barren crags as they pass through British Columbia’s Mount Robson Provincial Park by train, or on the highway. Visitors arrive at the park to enjoy activity. 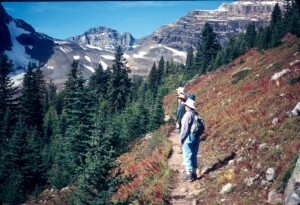 Some wish to scale the steep mountain’s cliffs, some will hike the many trails to higher meadows and viewpoints. Many will relax in its shadow at a campground, or perhaps throw a fish line to a hungry fish lurking in some nearby waters. At this park you will not likely go home without having seen some of the many deer, or bears. 2- Just next door to the east is Jasper National Park. One of the more secluded attractions here is Maligne Lake. This 22 kilometre long lake is edged by tall white capped mountains, a fact attested to by the many people who have taken a ride in the available tour boat. Others take their own water craft and enjoy the silence of being alone, and may stop at one of the campgrounds… a long trip with weather to look out for. 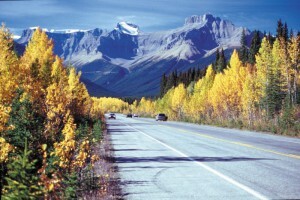 3- The Banff-Jasper Icefield Parkway’s 230 kilometres is a five star spectacular. Winding between high snow clad mountains, and occasionally rising up and over a pass, this highway has some of the best scenery on the continent. 4- Still in Jasper NP is the outstanding Athabasca Falls which drops 23 metres into a narrow gorge. The entire flow of the Athabasca River disappears into the ravine with a tremendous roar. Canada’s early explorer, David Thompson, tried navigating the Athabasca River hoping to find a route to the Pacific Ocean way back in 1810. 5- Continue south along the Endless Chain Ridge, a long sedimentary ridge that has swung from the horizontal, upward, as if hinged along one side. 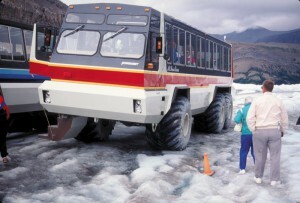 6- The Columbia Icefield has become a necessary stop. The Icefields are the remnants of the great icesheet that once covered this part of Canada. Ten thousand years of a warming climate have removed thousands of metres of ice leaving us with what is now visible. When earlier explorers came here the icefield reached across the valley where the road is now. You can expect the that the ice will retreat more quickly now. Over 10,000 years the suns’s energy was used to melt vast quantities of ice. Now many thousand cubic kilometres of ice are gone, and the sun’s energy will now be used to heat the earth and the air. Sounds like a good reason for the earth warming. If you take a ride in the large people movers you get a chance to ride out on the ice in safety. 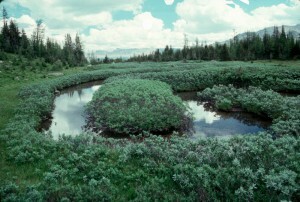 7- Along the Parkway expect to see many basins containing small lakes, often a beautiful turquoise colour, reflecting the image of a nearby mountain. Peyto Lake has a short hiking trail that takes you to a perfect viewpoint. 8- Now the jewel of the Rockies. 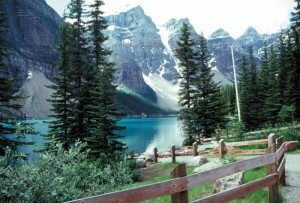 Banff Townsite is the main attraction for thousands of visitors to the Rockies. This small town is wedged between the mountains, yet contains fine lodging, good food, and numerous trinket shops. You may also find a few elk just loafing about. Good camping above the town, too. 9- The often photographed Banff Springs Hotel is a great place to visit, and stay. 10- Lake Moraine and the Valley of the Ten Peaks can provide one of the best places to visit for mountain scenery, and great hiking up to Larch Valley and nearby Wenkchemna Pass. The lower area is now too crowded but is still beautiful, but you can get away by yourself by taking one of the hikes. 11- Is there anyone who does not know about Lake Louise? It’s the fabulous blue/green lake backdropped by a massive mountain. Again, so many people go here in season that you should likely try to avoid it, and save it for off seasons. 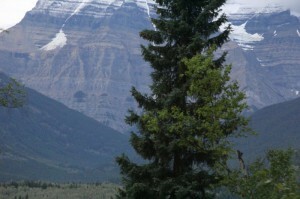 This is a short list of the many attractions in the Canadian Rocky Mountain region. If you drive the Icefield Parkway, I suggest you turn around and do it from the other direction. The scenery will look totally different to you. Twice the enjoyment for you. For more details and maps download my Scenic Trails book, CANADA: Beyond the Far Horizons.